Leave it to me to snag this striped turtleneck sweater by Acne during high summer season in Australia. I was immediately drawn to the mustard/brown shades and as you already know, I am a sucker for stripes. Of course, the fact that it was on sale made it more enticing. 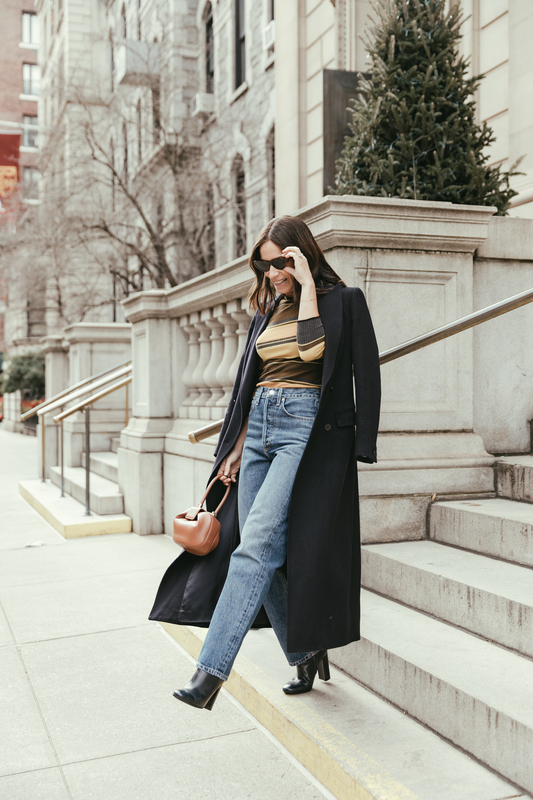 I envisioned myself wearing this striped turtleneck with a high waisted tapered jean and thats exactly how I wore it here. Love these AGolde ones that I found on Net-a-Porter and paired it with a navy leather ankle bootie (see similar ones here) with a stacked heel by none other than Gianvito Rossi. I threw on my favorite navy duster by Sui Studio and for a little funky time, I added these brown tortoise shell cat eye sunglasses by Celine. 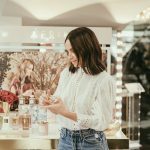 Some good news and some bad news – bad news first…This striped turtleneck sweater is almost completely sold out but the good news is that I am a big fan of Acne so there are many funtastic options to choose from. I only recently realized how many pieces I own from this brand when I began to write this post. To begin with, if you don’t already own an Acne oversized double breasted blazer, it definitely makes for a wise investment as it remains a classic, season after season. I purchased a navy pinstriped one a few years ago and continue to wear it in the spring and through the fall. This past season, I purchased the same style blazer in an orange color. When I tell you I had to have it, I had to have it! So much so, that even though it was sold out by September in the states, lucky for me, the salesperson at the Acne boutique scored one for me in Amsterdam. The pieces are extremely well made and at a moderate price point. As I mentioned, they are classic pieces but the brand’s use of color, style cut and design, ups the cool factor. Also worth checking out are their trousers, many of which are wide legged and cropped. My favorite this season are these pink wool ones which I actually paired with the orange blazer. If you have never tried this brand, definitely worth adding something from this Swedish collection to your repertoire.